This is Part Two in a series about Chicago’s Experimental Film Coalition; and covers their screening series. You can read Part One about their origin here. Formed in 1983, the Experimental Film Coalition started holding regular monthly screenings most likely beginning on January 27, 1984. Any earlier screenings information has not been uncovered so far. One of the original members of the Coalition, David Koblesky, recalls discussing the need to show more experimental films in Chicago with John Luther Schofill, a professor at the School of the Art Institute of Chicago (SAIC). At the time, the only venue in the city at which to see experimental films was Chicago Filmmakers, which was incorporated in 1976. According to Koblesky, Chicago Filmmakers adhered to the screening format advised by the Film-makers’ Cooperative in 1962: Screen only the work of one filmmaker per screening. Koblesky and Schofill wanted to upend that format and show multiple works of different styles by different filmmakers at each event. For example, at that January 27, 1984 screening, the Coalition presented several films by collage filmmaker Bruce Conner, the No Wave-influenced Rachel Reichman and the prolific Stan Brakhage. Koblesky and Schofill arranged to have these screenings at the Randolph Street Gallery, an alternative performance and exhibition space located at 756 N. Milwaukee Ave. Schofill built a wooden box for the projector to dampen its noise during the screenings while Koblesky, a graphic artist, designed the promotional posters. 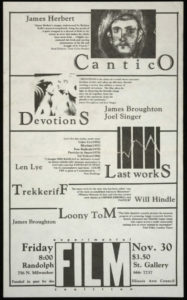 The two flyers seen in this article are Koblesky’s work and were found on the SAIC’s archive website where the Gallery’s archives were donated after it shut down in 1998. Screenings were run by Schofill and Koblesky with help from SAIC students. Modest entrance fees were collected to pay for the film rentals, while the Gallery sold concessions, such as beer, wine and snacks. Koblesky recalls that around 200-300 people would show up for these events, which were held on Friday nights. Films were selected specifically to mix more challenging films with crowd pleasers per event; and with the Gallery selling refreshments the screenings had a sort of party atmosphere. The Schofill-Koblesky run screenings lasted for “a year or two.”. 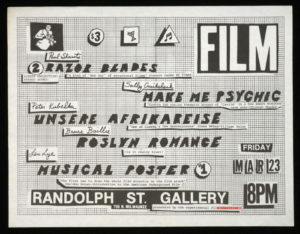 However, the Randolph Street Gallery archives show that the Coalition screened films at least until 1993 and continued the tradition of showing the work of multiple filmmakers at each event. Who took over from the two screening founders is unknown at this time.